“SHE’S FOR SANDAL-WEARING, MUESLI-CHEWING, BIKE-RIDING PEDESTRIANS.” THIS WAS PAUL KEATING’S EXTRAORDINARILY ARROGANT DISMISSAL OF MAYOR CLOVER MOORE’S PRESENTATION TO NSW PARLIAMENT OF A PETITION WITH 11,000 NAMES PROTESTING THE CURRENT DESIGN PLANS FOR THE BARANGAROO URBAN WATERFRONT DEVELOPMENT, WHICH LED TO HIS REACTIONARY RESIGNATION FROM THE PROJECT. Tucked within the more sedate enclave of Sydney University’s Architecture Department, far from the combative squabbling of ex and current politicians, the Tin Sheds Gallery in April hosted The Right To The City, a multifaceted exhibition, symposium and publishing project that, while not directly concerned with this particular urban conflict, echoed its tensions by seeking open-ended responses to the spatial politics of the city. Here, interdisciplinary artists cultivated the gallery space and beyond with sculptural objects, installations, video, photomedia and speculative works that circumvented the top down approach to urban planning, testing what might emerge in the interstices of public, creative and professional dialogue. This was by no means unfamiliar territory for co-curator Zanny Begg, who two years earlier helped create an impressive exhibition for Performance Space, There Goes the Neighbourhood, which explored the regeneration of Redfern (RT92, p52). At Tin Sheds, where she is Director, Begg worked in tandem with University of Sydney Senior Lecturer Lee Stickells to present an exhibition more general in reach, taking as its starting point a 2008 article by British geographer David Harvey, “The Right to the City,” although his are concerns that have been percolating for some time. They are questions of access, whether we build for people or for profit, how public and disused space might be used more creatively and what power, if any, citizens have to influence the development of the city. Despite the timely and prescient nature of these concerns Sydney is notoriously a city driven by consumerism, which means that urban activism is often met with apathy. Yet the continuities between works presented in this exhibition reveal how, as life increasingly falls into an earn/buy cycle, certain symbols that resonate as alternatives are at least gaining greater visibility. Among the most prevalent is the communal garden. As an embodiment of sustainability, collectivity and self-reliance it’s understandable that it figured in a number of works presented. The most striking treatment was arguably a multi-channel video installation by the France-based architects Constantin Petcou and Doina Petrescu, At the Ground Level of the City (2001-2005). This was an unconventional account of their ECObox project, a series of nomadic self-managed community gardens installed in urban wasteland sites in the suburbs of Northern Paris. 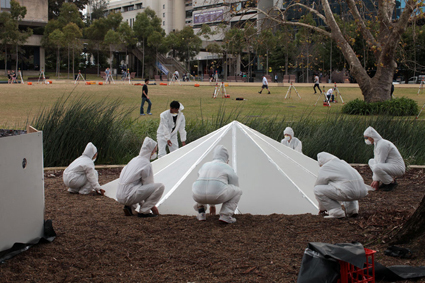 Drawing upon 99 hours of archive footage of the gardens gathered over five years using a “participative camera” that passed through multiple hands to record everyday life at the sites, a dynamic and non-linear documentary approach successfully conveyed the fluid and evolving nature of these reclaimed spaces. Played in fast succession and spliced across seven screens, the footage was set to a soundtrack mixing industrial noise, world music and snippets of conversation, injecting vitality into the ‘quotidian’ while avoiding romanticism in the subtle acknowledgment of the inevitable development of the sites. 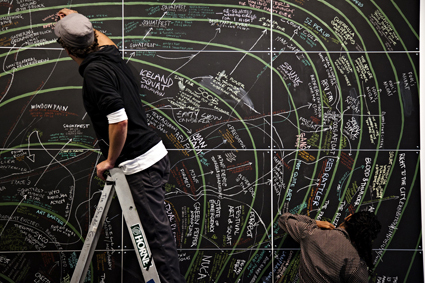 In a nearby corner, Sydney’s SquatSpace responded to the challenge of recording the collective’s transient history by using chalk to plot their 10 year legacy of urban activism on panels of blackboards in an ebbing and flowing ephemeral timeline, Network Map (2011). The sprawling and indefinite history was complemented by a short documentary film by Justin Hewitson, Squat the Lot (2000-2003), which recounted the turbulent period when artists occupying vacant council-owned buildings on Broadway were evicted prior to the Sydney Olympics. The video was perhaps the most outspoken work in the gallery, as others appeared more concerned with subtler, less anarchic modifications of urban space. Chicago’s Temporary Services surveyed with a forensic eye milk crates refashioned into basketball hoops and roadside memorials in their series of photographs, Public Phenomena (2008-2010), while urban redevelopment took a lo-fi turn in Milkcrate Urbanism’s The North Eveleigh Propositional (2011). After a mobile feedback box was dispatched to various locations around Redfern inviting alternative development proposals for the former railyards site, the feedback was incorporated into a newspaper style publication and pinned to the wall although, with only three suggestions on display, this particular speculative project felt a little incomplete. When the force of nature unexpectedly asserts itself, the task of remaking the city becomes a more urgent dilemma. Hunkered down in an outdoor refuge campsite a short walk from the gallery, DV Rogers presented the 14-day endurance performance installation DISASTR Hotel (2011), which saw the artist build two hexayurt shelters following an open source design by Vinay Gupta and then invite visitors to stay overnight to judge the efficacy of the shelters and to consider their own preparedness for a disastrous event. Some Ballardian style signage spelling out DISASTR in large letters studded with brightly coloured light bulbs created a performative setting, however this was not a work of science fiction. On the contrary, Rogers was concerned with enacting “a symbolic field test,” demonstrating how DIY open hardware structures already exist as viable transitional responses that could be set up in present day disaster zones. The question is, what is holding us back from implementing them? With a tagline citing Buckminster Fuller’s provocation “we are called on to be the architects of the future, not its victims,” the exhibition’s earnestness was counterbalanced with some playful, tongue-in-cheek works. The Holmes stereoscopic viewer received an anthropological twist in Tessa Zettel and Karl Khoe’s primitive masks jerry-rigged with plastic ephemera and clapped-out gauges. Another collaborative duo, Claire Healy and Sean Cordeiro, accosted visitors with Sound Barrier 2011, a giant wooden catapult sporting a slingshot stockpiled with fluorescent orange earplugs. Flung target practice style at a blank white board, the spray of compact foam bullets on the wall resembled a minimalist colour field painting meets urban-noise-pollution-dart-board, a witty indictment of how the gentrification process demands not only land but also sensory homogenisation. Stepping outside the gallery and into the courtyard, where students and lecturers were breaking between classes, reinforced how critical the site was to the effectiveness of this exhibition. Some of the less polished, work-in-progress installations might not have withstood the tougher aesthetic scrutiny of an austere white cube space. But in an environment where art, design and education naturally cross-fertilise, such works became key components in what was essentially an art forum. While we may lack a centralised method to surmount the circle of government, developers and purchasers who largely determine the evolution of our cities, by giving expression to the humbler gestures and desires of the everyday, this exhibition highlighted the alternatives that can burst through the cracks when necessity, inspiration or sheer dogged perseverance take hold.